Glorious weather the last few days but we knew it had to end and so it does, going from the 30’s Tuesday morning (even found some ice on raised exposed surfaces) to the high 80’s the next day, ugh. We did take advantage of the enjoyable conditions to get a lot done. 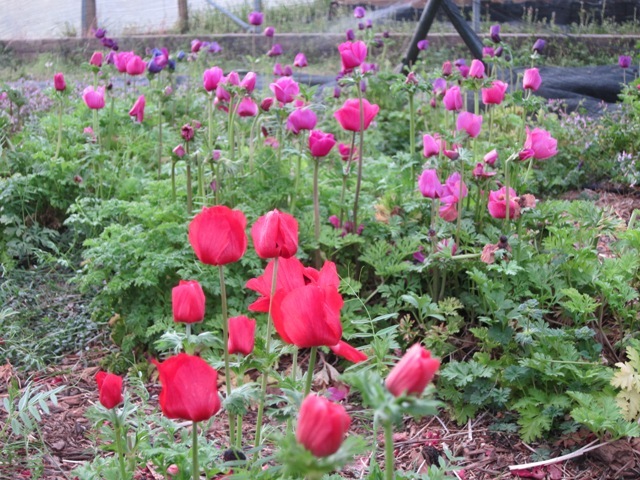 Planting is caught up and nearly so with cultivation and weeding. The mowing is relentless this time of year but the incessant growth should slow down with the heat. We have been working on the pre blueberry picking clean-up of the patch with hard mowing and then cutting out the bird volunteered small trees, honey suckle and other vining things including poison ivy. The problem with perennial plantings is sooner or later all kinds of weed seeds are deposited by wind and birds that perch in the plants. 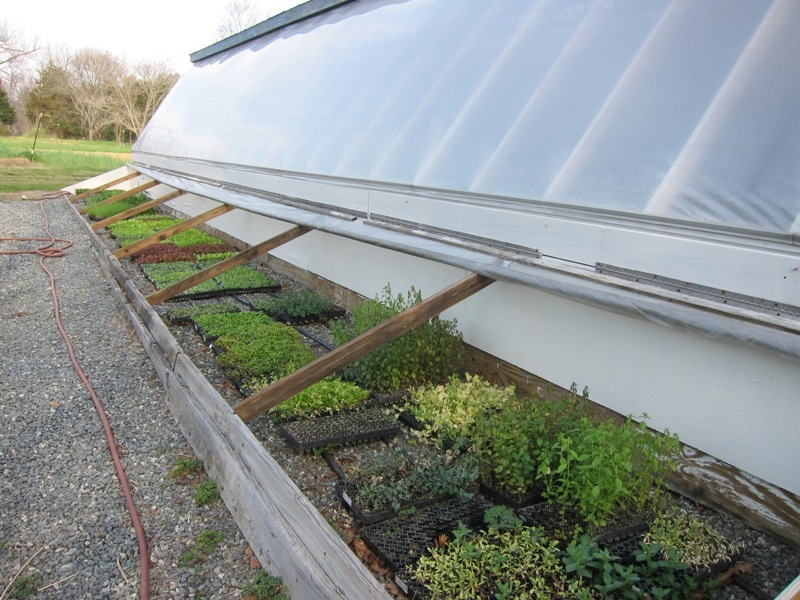 Unlike an annual planting which you can turn under and kill any sprouted plants, here the unwanted can get a foot hold and hide from mowers, weed eaters and pruners. After 23 years in the ground we have some crafty invaders. After nearly two inches of rain last week we are now racing around getting the last of the irrigation set up to try and reduce the shock to the crops that have been luxuriating in the cool spring weather. Add to that covering two more Big Tops, whole sale deliveries of lettuce to Weaver Street Market and snatching spare time to try and finish up the building project we have officially hit the busy season. Despite that we did have two “family” moments this week. First we did race up to Burnsville to help Rett clean up his fields after last week’s flood, picking river rocks out of the planting areas, pulling up sand covered row covers and debris filled pea trellis. Eight hours of driving for four hours work but we just had to go help. Monday Elizabeth, worked for us six years ago and is getting married in two weeks, came out to have her wedding dress photos taken out in the fields. Always non-traditional the shots in the onion field certainly will be different from your normal bride pictures. On a final note, Dalton Zachary one of the long time vendors at the Carrboro Farmers’ Market, a neighbor of ours and a continuing inspiration is turning 90 tomorrow and will be at his market stall, as always, with his family. We are always amazed at how he does it all. OK, time for things to settle down weather wise, last weeks cold snap was to be expected but this weeks cold, along with the high winds is more like March than almost May. 31 degrees on Tuesday morning, luckily the gusty winds of Monday died just at dark and Betsy and I were able to pull the big floating row covers over the tomato trellises and the first 2000 celosia plants and all was good. As soon as the wind picked back up yesterday it promptly blew the covers off of the tomatoes, even weighted down with bricks and metal T-posts. High winds all day again Tuesday and they didn’t really die at dark. The forecast was for 39 degrees and light winds so we nervously left the covers off, woke up to rain at 5:00 a.m. and knew we were safe. Farm Tour weekend coming up and some of you astute observers may have noticed we are not on the tour this year, what!!?? Well after founding the tour seventeen years ago and being on it every year since, we decided it was time to take a break and maybe do something different. Not yet exactly sure what something different might be but we are planning on an open farm event or two this year so look forward to announcements of that, you know old dogs and new tricks take sometime to develop. Otherwise we plan to have a relaxing weekend and hope that all of you going on tour find interesting things at the 40 farms that are open this time around. What is coming up fast, that we are involved with is this years Farm to Fork picnic, billed by Bon Appetit magazine as the “Country’s best all-you-can-eat feast”, it is much more than that. All of the great chefs, farmers and artisans, the huge tents, music and kids events cover up the fact that this is an important fundraiser for new farmer programs in North Carolina. All of the proceeds go to the farm incubator program at the Breeze farm (where the picnic is held) and to the beginning farmer and apprentice programs at the Center for Environmental Farming Systems in Goldsboro. Everyone involved in putting on this amazing event donate our time, products, and skills because it is so important to grow more local farmers to fill both the demand for local food but also to help stem the tide of an aging farm population ( I know I am one of them!). All you have to do is donate your palates and some money for a ticket, it is earlier this year, Sunday May 20th, so hurry because last year this event sold out in just a few days and tickets just went on sale a few days ago. The start of the season but what does that mean anymore? There used to be one date that our entire spring schedule and life revolved around. For nearly 20 years the Carrboro Saturday market opened the second to last week of March and our focus was on having things to sell by then. It coincidentally was the same week as the equinox and the first week of astronomical spring, a nice farmer like punctuation mark. Now with the year round Saturday market, the changing climate, and the earlier and earlier daylight savings time (it is still barely light at 7:00, again!) our internal clocks are way off kilter. The year round market has all of us farmers trying to figure out how it fits into our particular farms crops and marketing mix. Because of our members ingenuity, stubbornness and changing technologies the winter market is much more robust than any of us could have anticipated just a few years ago. But for us old dogs, it is harder to adapt. In our 31st year farming and the 27th at market we remember when the Saturday market didn’t even open until the first or second week of April and even then there was not much on the tables of the vendors. Betsy and I are continually testing the waters and as many of you know we have been at market almost every week this winter. Partly because of new crops (Ginger and Jerusalem artichokes) and timing of crops (Anemones since Christmas) that we needed to sell, partly because of the extremely warm winter but partly because we are trying to adjust our schedules to the changing climate. Are we going to become year round vendors? No, but we are moving some production earlier and later in the season in an attempt to avoid the brutal heat of summer. We still want our winters off but they might be shorter than they used to be. Old dogs, new tricks. For those of you we have not caught up with at market we did have a great winter season. Lots of travel and teaching including Betsy to Italy for further study of the language and Alex with two trips west to go hiking (Utah and Texas). Conferences and teaching events in Louisiana, Virginia, Tennessee, Arkansas and Georgia, whew! It is all over now and the staff started yesterday with Jennie back for her second year and Liz in her first, a great beginning for a new season even it we don’t really know when that is anymore. April fools day, well we’ve been fooled all week by the weather that’s for sure. 26 degrees on Tuesday morning, to be expected in late spring. We covered the early tunnel tomatoes and everybody was fine, the blueberries will let us know how they did, we could be fooled. What really fooled us this week was the rain. Looked like a rain day on Monday and we only got a tenth of an inch. Looked like a rain day on Wednesday and we got a great rain of just over an inch. Looked like rain for sure yesterday afternoon so had the staff only work a half a day and we barely got any water from the sky. Hard to call sometimes and we just don’t have much inside work right now. It’s like that in spring. You try and have a plan for the week and the extremes of weather really decide what you will do. Fortunately the staff understands, they would rather work and make some money but they know if it is too wet there are only so many things we can do. Can’t till soil, can’t cultivate, etc. So it’s late spring chainsaw season. There is always a field edge to clean up/fight back and when it’s a cold morning a little brush fire is a welcome thing. So Tuesday we worked over the edge of the woods at the very top of the farm, it has probably been 15 years since we did it last. This morning it will be some firewood cutting until it warms up and then we can harvest a bit for market. So it goes. Great staff this year, like all years it seems. Glenn is back for his third season and has taken the reins of responsibility in hand. Jennie is new to us this year but has been working on farms in the area for several years. They are doing an excellent job and everything really is in order. I just wish we had more to do right now. Now that really is an April fools joke because in a few weeks we will be overwhelmed with work and begging for a break. 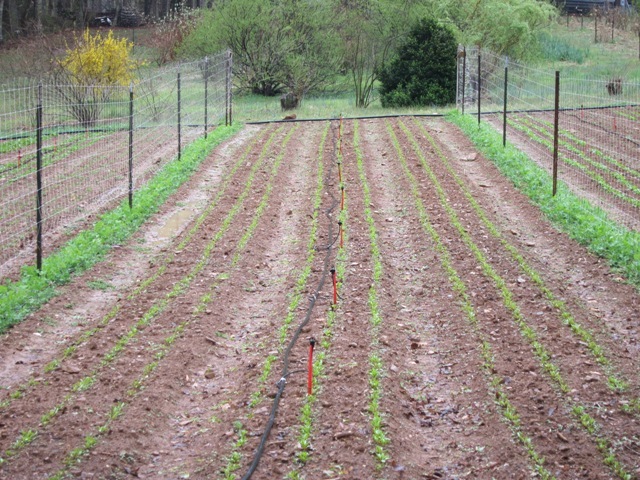 A wet day but the peas and the beets really like it. Happy Spring to you all! Let’s see, where to begin? How about this is our 30th year growing crops for all of you. There is a gravitas that comes with three decades of doing something that I hadn’t really thought about until speaking at conferences this winter. I kept saying this was our 30th growing season and the looks in their (mostly) young eyes was of disbelief or no comprehension. It is like the concept of a billion of something, peoples brains can’t visualize how big a billion of something is or maybe it is like sailing and the curvature of the earth makes it so your world is only as far as you can see. So far from this side of the curve, it looks pretty good. When your life is measured in seasons more than time- this was a wet one, that was a historic drought, the Easter freeze, hurricane Fran, etc. Your perspective becomes how they compare to each other more than when they actually happened. We can say that so far this is starting out to be a really marvelous year, last year not so much. All of the crops look so much better this spring than last and as good a start as we have had in several years. The staff started last week and we hit the ground running with the great weather. The little tunnels have been slid to their summer locations and the first tomatoes are going in today! We are on schedule with planting and have already cultivated all the crops in the ground as the conditions have been perfect. It was a busy and slothful winter with both lots of meetings and trips away from the farm, as well as time in the house with all the cold weather. A great event for the Southern Foodways Alliance in Tennessee in early January and then a return to Tennessee for the Southern Sustainable Agriculture Working Group’s meeting in Chattanooga, where I taught a couple of classes. The final conference of the season was a trip to Georgia Organics in Savannah where also gave a couple of workshops. It’s back to serious work now.